"This recipe calls for freezing a head of cabbage overnight to soften the leaves to wrap around a beef and rice mixture." Place cabbage head in freezer and freeze overnight. Remove from freezer, thaw and peel away leaves. Combine the beef, egg, onion, rice, salt and pepper. Mix together well. Take a small handful and form into a small roll or ball. Place into the center of a cabbage leaf. Fold the sides of the leaf over and roll the ball up into the leaf. Place seam side down in baking dish. Continue until all of the filling is used up. Mix together the soup with a 1/2 can water; pour over stuffed cabbage. Bake uncovered at 350 degrees F (175 degrees C) for 1 hour; baste often with the sauce. 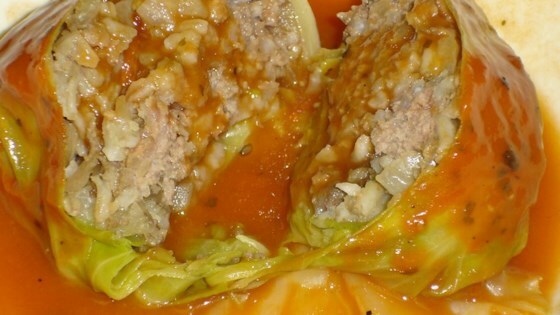 These stuffed cabbage rolls make a great dinner for a crowd. I liked it, but found myself in the bathroom due to tremendous gas. It gave me the poops! It was tasty though. Jeez, I just farted. I did not freeze the cabbage. I think by par broiling it, you "de-gas" the cabbage. I also cooked mine in a crock pot on low for 8-9 hours. It turned out better than I remember as a child! Excellent recipe. I make something similiar/quicker. I chop the cabbage and saute with ground beef, spicy pork sausage, mix in cooked rice and tomatoe soup for one pot meal. Thanks Barb.